Welcome to La Casa dei Fiordalisi. From this page, you can explore the individual rooms and gardens of La Casa. See the ancient city wall, view the quiet, retreat-like places in the garden, bask on the pool deck, and be inspired by the kitchens to enjoy eating the best food and wine in the region. Experience the Tuscan life style: great food, great wine, great beauty, and great people at a life affirming, gracious pace. Click on the links to tour La Casa dei Fiordalisi. 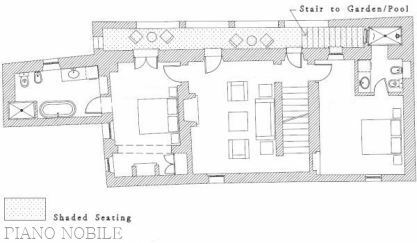 On the ground floor you'll find the main kitchen, with wood grill, a working pantry, dining room, living room with fireplace, pool bar with ice maker, pool and sun terrace, shaded outdoor sitting room, large shaded dining terrace and a vegetable and herb garden. La Casetta is a fully appointed private suite with outdoor view terrace, sitting room with fireplace and sof abed (suitable for small children), kitchen, dining table, spacious bedroom and full bath with washing machine. Quiet and private, it connects directly to the activity and fun of the main terrace and garden. Up the main stair from the ground floor is the Piano Nobile with two bedrooms with private baths and a sitting room with an original fireplace (non-working) and sofabed (again, suitable for small children). Outside is a covered brick loggia overlooking the garden with views out to the countryside and a stair down to the garden and pool. 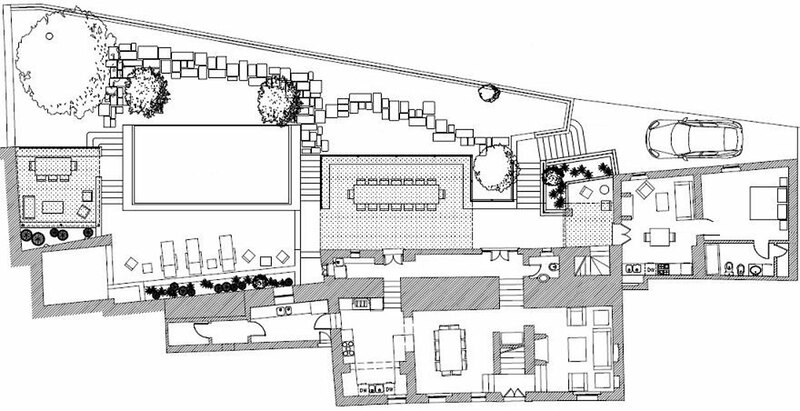 This floor has a shaded view terrace along its entire west edge, each of the two bedrooms opening onto it. Both bedrooms have high beamed ceilings and private baths. 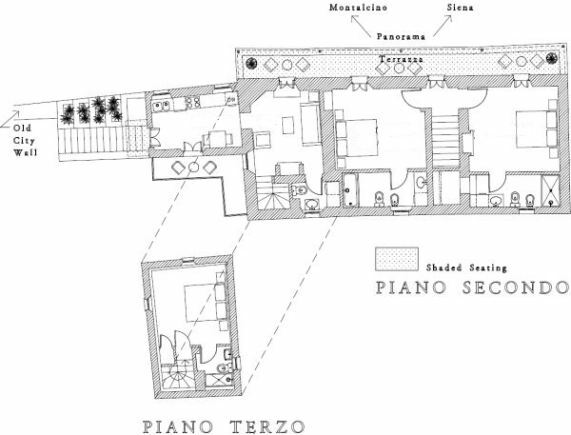 Along the terrace is a doorway to the private suite, La Casa di Città — the little house of the village. Entering La Citta on this level, you will find a sitting room with fireplace and 1/2 bath with washing machine. Adjoining is a lovely kitchen with beautiful views and a dining table, with French doors to a village-view balcony for morning coffee and the doorway to the ancient stone stairway to the village street below. Up a spiral travertine stairway is a sweet bedroom with a high-beamed ceiling and 3/4 bath. There are entrancing views of the village and countryside from the bedroom.